The Sartell Muskies are a class 'C' amateur baseball team and a member of the Minnesota Baseball Association. The team plays in the 15-team Lakewood League and is a member of the Sartell Baseball Association. Muskie players are mostly products of the Sartell youth and high school programs, while a few are transplanted Sartell residents. Many of the players are current or former college players at the NCAA Div. II, Div. III, and Jr. College levels. The Muskies play for the love of the game, and strive to promote community pride and amateur baseball at all levels. The Muskies were formed in 1979 and played initially in the Sauk Valley League. The team was immediately successful, making the state tournament in its first 2 seasons. (first row) Mark Guggenberger, Steve Paul, Rip Rassier, Graham "Punky" Hendrickson, bat boys Todd Ohotto and Chuck Nelson, Pete Hess, Roger Ohotto, Greg Frank, Tom Gaughan, (back row) team host Sid OíHara, John Vinge, Dave Wickstrom, Steve Johnson, John Dolan, Mike Roth, Lynn McClintok, drafted players, Jeff Neutzling from Avon, John Taufen from St. Joseph , John Omann from St. Stephen, and Bill Nelson. The Muskies played for 2 seasons at the Sartell High School field, which is today the primary Middle School field. In 1981 they opened Muskie field, which the team built with their own labor. The project was organized by Larry (Rip) Rassier, Urban Frank, Larry Traut, Dave Guggenberger Sr., Tom Gaughan, Jim Ohotto, Harold Perry, and their wives. This group raised money for Muskie field through turkey parties, game program advertising, and a golf tournament. Donations were also made by Sartell citizens and the DeZurik and Champion companies. The land for Muskie Field was donated by the city of Sartell. In 1995, lights were added to Muskie field through a large donation from the Champion Paper Mill. Muskie Field was renamed Champion Field to honor this donation. 1992 Muskies team earned the clubs first state championship. The team went 5-0 during the tournament, which was held in Jordan and Belle Plain. Ace pitcher Scot Hille was named the tournament MVP for pitching 3 complete game victories. 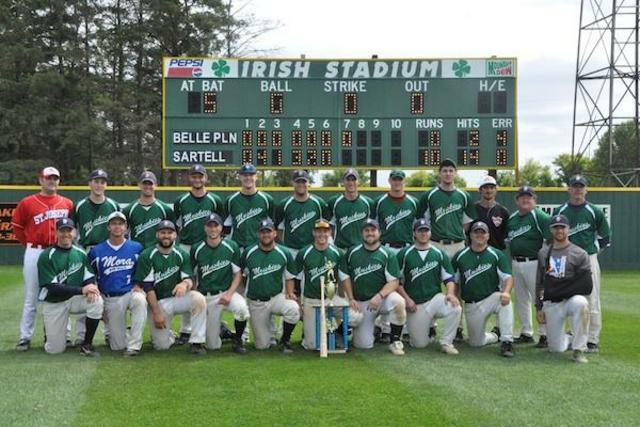 In their 35th season, the 2013 Muskies earned the teams 2nd class 'C' state championship. The team went 5-0 in the tournament, which was held in Delano and Maple Lake. The Muskies defeated Lake Crystal Nine (6-0), Sobieski Skis (2-1), Fergus Falls Hurricanes (11-4), Jordan Brewers (1-0), and the Belle Plaine Tigers (10-0). Second baseman Andrew Deters was named to the all-tournament team and tournament MVP. He batted .450 and was a defensive standout. Other Muskies named to the all-tournament team were pitcher David Deminsky, first baseman Jake Sweeter, and outfielder Dan O'Connell. The Muskies have qualified for the state tournament 10 times; in 1979, 1980, 1987, 1988, 1992, 1993, 2006, 2010, 2012, and 2013. Two Muskies have also played major league baseball. Greg Thayer was a pitcher and slugger for the 1992 championship team. Before that he pitched briefly for the Minnesota Twins during the 1978 season. He relieved in 20 games for the Twins that season, earning 1 win. Ben Hendrickson pitched for the Muskies in the late 1990s. Ben was a prep star at Minneapolis Jefferson but played for the Muskies while his father Punky was the Muskies manager. Ben was drafted and signed by the Milwaukee Brewers in the 10th round of the 1999 draft. Ben has pitched 58 big league innings with the Brewers during parts of the 2004 and 2006 seasons, and also has 1 major league win. The current squad began a rebuilding effort in 2004, with only 5 current players remaining from the 2003 team. The 2006 Muskies began a run of success, reaching the state tournament for the first time in 13 seasons, and the region playoffs for the first time in 7 seasons. From 2006 to 2013, the team qualified for 8 straight region playoffs and 4 state tournaments, compiling an overall record of 191-84 during that span. 2013 was Manager Randy Beckstrom's 25th Muskie season. He is the last remaining member of the 1992 state champions, and also helped win a title in 1995 when he was drafted by the Sauk Rapids Cyclones. He was Manager for a time in the 1990s, and resumed those duties for the successful 2006 season. Front, L to R : Travis Weaver, Chad Yarmon, Chris Feneis, Brandon Knettel, Eric Oscarson, Dan Gaughan, Steven Fish, Josh Rathbun, Mickey Knettel.